Colette Dowling watched depression destroy her husband’s life and leap to the next generation to nearly destroy her daughter’s–until dramatic help was found. Now her ground-breaking book offer the same lifesaving help to the millions who still suffer depression and related disorders–which include panic, anxiety, phobias, PMS, alcohol and drug abuse, bulimia, migraine, and obesity. You Mean I Don’t Have To Feel This Way? 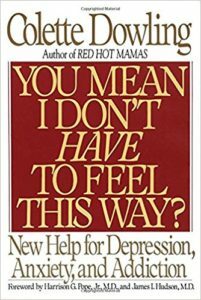 documents the latest research that links depression and related disorders to a physical cause and shows why willpower, understanding, and psychotherapy so often fail to work. It explains the state-of-the-art medical treatments that can bring about dramatic improvement–and often full recovery–within weeks. This important book includes: startling new links between eating disorders, addiction, and depression. How to recognize the symptoms of depression and anxiety disorders. Vital information about new treatments for depressed children and adolescents. A guide to breakthrough drugs for treating mood, anxiety, and eating disorders. The newest research on the use of antidepressants to prevent substance-abuse relapse. How to find expert help and evaluate the treatment you are given. Upbeat, filled with hope and warmth, Colette Dowling’s book will change minds and save lives.